This is what AP Business Writer Allison Linn was asking herself. To get an answer, she decided to spend one week relying as much as possible on free Web services for everyday business tasks. For now at least, Microsoft is right -- these challengers will complement, not replace, my Microsoft Office software. My overall favorite turned out to be CalendarHub, which easily imported four years worth of calendar data into a pleasing interface and -- like several out there -- offered handy e-mail reminders of upcoming events. Also, although it is nice in theory to be able to access data online, in practice it often took longer to log on to different applications every time I needed something, rather than just opening a file on my desktop. That's right, Mrs. Linn. This is one of the reasons we're creating Pageflakes. Our plan is that some time in the not-so-distant future, Pageflakes will allow you to access all your applications and all your data conveniently from one page. When you can carry your applications to the Web, why leave your desktop behind? Full Disclosure: I'm affiliated with CalendarHub and Pageflakes. The Whole Web at Your Fingertips: Introducing Pageflakes. I’m exceedingly happy to announce Pageflakes, my new startup. Pageflakes will start as a personalized startpage (a.k.a. AJAX desktop) that allows you to read blogs and other RSS/Atom feeds, check your email, get the latest sports news and stock quotes, start Web searches and use services like Del.icio.us or Flickr, all conveniently accessible from any PC and from one page. I’m sure there are at least 5-10 sites that you check every single day, in fact probably several times a day. Pageflakes saves you some of this effort by aggregating the content that’s relevant for you into one nice page. A bit like an RSS aggregator, only that it’s not limited to RSS feeds. But that’s only the beginning. Over time, we want Pageflakes to evolve into THE entry point to your digital life, allowing you to do everything from managing to-do lists to watching Internet TV to checking your voice mailbox and much more. A suitable name for that might be Digital Life Aggregator (similar to the term “Digital Lifestyle Aggregator”, which AFAIK was coined by Marc Canter) or Next Generation Internet Services Platform (a term recently used by Microsoft’s Ray Ozzie when talking about Microsoft’s new Live.com initiative). If that sounds familiar to you, the idea of a personalized startpage has been around for years. Excite and Yahoo tried it several years ago, but we think it takes new technologies and approaches like AJAX, RSS and APIs and other Web 2.0 ideas for this concept to really take-off. Thanks to AJAX you’ll get a desktop-like experience. Thanks to widespread content syndication you’ll be able to add an incredible variety of content and services to your personal page. To make the Web 2.0 buzzword compliance, we also address The Long Tail of software by allowing developers to contribute their applications to Pageflakes. We just launched our “Developer Release”, so right now we’re not even in alpha yet. However, if you go to our site you can already see some prototype modules (“flakes”) and enjoy some AJAX Drag & Drop goodness. When you look at the site, please don't forget that we’re pre-alpha. 99% of the functionality is still missing, the design implementation is not perfect yet and there are still some glitches. Basically we're at a point where others put up a teaser page. Once we target the general public, we will also support Firefox, of course. Finally, if there’s anything that I’m more excited about than the idea itself, it’s our team. It includes someone who co-founded Alando.de (which was acquired by eBay) and an exceptional team of oustanding software engineers from Bangladesh. I think this posting is too long already, so I’ll talk some more about my partners on a later occasion. Now have a look at Pageflakes, subscribe to the launch notification and let me know what you think! P.S. : “Are you kidding me? Do you really want to compete with mighty Microsoft and Google?” Well, in a way we will. In the beginning, Pageflakes, Live.com and Google’s Personalized Homepage will look pretty similar. But over time, we expect the three to develop into somewhat different directions. We’ve got a hell of a lot of cool ideas on how we’re going to improve and extend Pageflakes in the future (and I’m sure so do the other teams – but we probably don’t have the same plans). In addition, our advantage as a small startup is that we’re quick, that we can flexibly react to the needs of our users and that we’re totally focused on what we’re doing. Finally, we’re not saying that we will drive Live.com or Google/IG out of business. There’s space for more than one player in this emerging market, and we’re satisfied if we get a sizeable chunk of it. Dion Hinchcliffe put together a great list of the best Web 2.0 applications released in 2005. Interestingly, only one of about 30 applications has been developed by a big corporation (Microsoft's Start.com) while the rest has been developed by start-ups - some of them tiny one- or two-person companies. As far as Web 2.0 is concerned, the greatest innovations still come from start-ups (although the GYM is close, as demonstrated with software like Google Earth and the new Yahoo! Mail). So far, two from the list have been acquired by one of the big boys: Flickr and Del.icio.us. I'm sure that in a year from now, a couple of others from the list will have been snapped up. My best guesses are Writely and Netvibes. Congrats to Sam (Writely), Tariq (Netvibes), Ian (Openomy), Jason (Writeboard and Ta-Da-List) and to everyone else who's working on the next generation of Internet software. I still can't believe Yahoo paid around $100 for my bookmark list. Clarence Wooten from Venturepreneur Partners wrote an interesting piece titled "Less Venture Capital: The New Model" in which he applies 37signals well-known "Less is Better" principle to Venture Capital. Is it taboo to build a company with the intention of selling it early? It sounds disillusioning and I think he may underestimate the negative effects which a "build to flip" attitude can have on employees and the whole company culture. The team needs a more imaginative vision than "getting acquired" (although I'm sure that Clarence would agree with that). In any case there's truth in what he says. From a founder's perspective I always found it questionable to chase the IPO dream if it means giving up the opportunity of getting acquired at the right price. There can be a conflict of interest between the VC and the entrepreneur with regard to the exit preference (Stefan wrote his diploma thesis about this topic, got to read it soo), since the former in contrast to the latter has a diversified portfolio and possibly a different ROI expectation and a different time horizon. For a VC, one home run and nineteen zombies might be a good yield on balance, but a founder might prefer a 30% chance of achieving a nice acquisition over a 5% chance of going public even if the latter has the higher expected value. The reason is the diminishing marginal utility of very large amounts of money for an individual. It's for a kind of similar reason that you buy an insurance although it has a negative expected value. BookBurro - tough times ahead for Amazon.com? BookBurro is a smart Firefox plug-in created by Jesse Andrews that lets you find the best book deals while you shop. When you're looking at a book page on a site like Amazon.com or Barnesandnoble.com, a little window magically appears and tells you the prices for that particular book from about 10 online bookstores. Comparing book prices doesn't get much easier or more convenient than this! At first sight, one could think that a tool like this must cause considerable headaches to Amazon.com. After all it allows customers to use Amazon.com's unbeaten site for browsing but proceed to another retailer to make the purchase with literally one mouse click. While comparison shopping sites like Shopping.com and Shopzilla are very popular and while I think they do contribute to limiting the pricing power of brand name online shops, the value of Amazon.com's brand shouldn't be underestimated. During the first wave of comparison shopping engines from 1998-1999, some analysts predicted that online retailers would never be able to make a decent profit because the radical removement of friction would effectively turn online shopping into a commodity market. They underestimated people's deep desire for convenience and the level of trust associated with Amazon.com. As far as BookBurro is concerned, it's interesting to note that the concept of on-the-fly price comparison has been around for years but never really took off. I know what I'm talking about, as my startup DealPilot.com launched a similar product, a browser companion toolbar called DealPilot Express, back in 1999. It never became as successful as the website, so Shopping.com (which acquired DealPilot.com) buried it after a while. RUSure, ClickTheButton and all other competitors of us from that time met the same fate. BookBurro is easy to install, unobtrusive and seems to work very well. It's definitely better than the first breed of such tools. It'll be interesting to see if they have success. Thanks to Library Stuff for the pointer. By passing around emails with an ASCII, monotype text representation of the possible dates and times, each person uses a symbol to indicate their preference and availability. German computer magazine CHIP has a story on Windows' 20th anniversary. 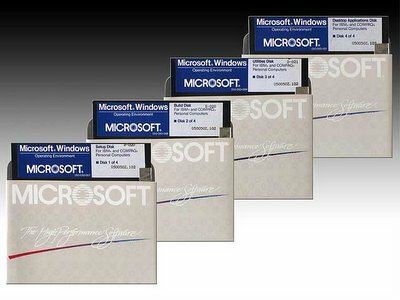 Windows 1.0 was scheduled to be released in June 1984 but didn't make it into the stores until November 1985. The story is available in German only, but if you feel like getting sentimental, here's a screenshot tour. Guess what these funny black squares are? No, no gramophone records. Your dad or elder brother used to call them "floppy disks". These 5 1/4 inch floppies here stored 360-1200 KB, but if that sounds a little small for your MP3 and DivX collection, remember that your dad and your elder brother were exceedingly proud when they finally got a floppy drive, as that allowed them to throw away their datasette recorder. The PC revolution of the past 20 years never fails to excite me. And as many others, I keep wondering if Moore's Law will still work in the next 20 years to come. Via Roland Tanglao: FON allows users to share their WiFi networks with other users. They're launching in Spain, but according to Joi Ito they plan to push out worldwide. The idea is interesting: If you have DSL, most of the time you're using only a tiny fraction of your available bandwidth. Why not give some of your extra bandwidth to that guy sitting in the café next door who is going online via an expensive UMTS connection? If you think of VoIP (read: Skype) via WLAN, it's getting even more interesting. In Germany, sofanetworks is trying the same. They have a slightly different focus though, as they also target to neighbours who want to share their Internet connection using a WLAN. So they not only want to save you costs while you're on the road, they even want to let you save your home DSL connection. Will FON and/or sofanetworks succeed? I'm still skeptical. One reason is security. What if the people who I share my Internet connection with will download illegal content from the Web? I'm sure both companies address this concern. But will users take on the hassle of learning more about the security situation or will they just stay away from the offer? The upside, after all, is rather limited: A share of the revenues generated with the user's WiFi (which I assume will be a few bucks per month in most cases), plus the promise of being part of a movement which kicks the big telcos in their pants. Another reason why I'm not convinced yet is that they need a large critical mass of customers in order to successfully match connection sharers with connection users. At least, FON's founder Martin Varsavsky has experience with that: Before founding FON, he founded telephone company Jazztel and Internet portal Ya.com in Spain, both of which became large companies. BTW, are you a "Bill" or a "Linus"? At FON, you can decide if you want to become a "Bill" or a "Linus". Bills get 50% of the revenues generated through their WiFis. Linuses, on the other hand, don't get the revenue share but in exchange they get free roaming among the FON network. YubNub is a command line interface for the Web that allows you to start all kinds of Web queries by typing a command, e.g. "g" for Google, followed by the parameter of your choice. Typing "g c# UML" (without the quotation marks), for example, will yield a Google search for the search term c# UML. Other popular commands include "wp" for Wikipedia, "gnews" for Google News, "tec" for technorati and "weather" (followed by a ZIP code) for weather information from The Weather Channel. In the same way you can use hundreds of other commands that have been created by YubNub's user community. Yahoo has a similar feature called Yahoo Shortcuts and Google lets you do searches like 10+5 or $ 10 euro, but none of these offers you nearly as many different commands as YubNub. Somehow I like the idea. Since I stumbled upon the site a few months ago, I've been visiting it every now and then. I didn't really "adopt" it yet though. Maybe many others feel similar. Are we spoilt by GUIs so that we don't want to remember any of those commands? Or is Google simply too good, not leaving any space for a service like this? I think the latter is a problem for many startups which try to do anything related to helping people find information on the Web. Google works so awfully well, it's hard to make people remember an additional URL. If you search any kind of information, chances are you'll find it quickly by starting your search at Google. As Google quickly turned from David to Goliath and I always sympathize with the Davids, I still keep my fingers crossed for YubNub, of course. Openomy is an online file system. You can store files on Openomy and access them from any computer. Openomy organizes files and users via tags (as opposed to folders). You can choose to keep your files guarded by Openomy, or allow certain outside applications (of your choice) to do new and interesting things with your data. So, do you have a separate hard drive for Word, Excel and Powerpoint? No? Then I'm not sure if it makes sense to have a separate file system and storage server for each Web-based application. I think Openomy is a really, really smart idea. I also think a viable business can be built around it. To enter the market I think they should build one really cool application that is closely tied with Openomy and give it away for free or for as little money as possible. The most obvious application, of course, is to address the terribly underserved market for online storage and remote backup. And while not offering a perfect solution for that need yet, they're already beginning to do just that. Adam Green says "Web 2.0 is just like Web 1.0 but with rounded corners and pastel colors". Hilarious. Just in case it's not a joke: I disagree, of course. Although there's legitimate criticism around the term - and IMHO the definiton is still a work in progress - it's much more. Michael Arrington from TechCrunch published a terrific list of 10 companies he'd like to profile but don't exist. Usually when you find a list of business ideas somewhere it's either "get rich quick" spam or a suggestion to start your own pizza delivery service. This one is different. Every single one of these ideas is highly interesting. Some of them have the potential to become huge businesses (e.g. "Online File Storage" and "Open Source Yellow Pages"). Some of them are smaller but are easier to build and could still support a very viable and profitable business. "Blog/website Email Lists" is one of those. This is one of the most insightful and valuable blog postings I read in a while - thanks, Michael. Check it out. If you're building one of these businesses, feel free to drop me a line to see if I can help you in any way. CalendarHub went from invitation-only beta into public beta today. In my opinion, which admittedly is biased because I’m an angel investor at the company, CalendarHub is the best Ajax calendar on the Web. Let me give you a quick elevator pitch. CalendarHub allows you to create a calendar that you can access from any PC with an Internet connection. If you like, you can share your calendar with others, or publish it on the Web. The site has a sleek Ajax-powered user interface which I’m sure you’ll like. Build a calendar for your own private use. Create reminders for birthdays, bills, leisure activities....anything you want. If you like, get reminders by email or SMS. You can also search published calendars for events and add them to your own calendar. Creating a shared calendar for your family is a snap as well. Create a team calendar which every team member can access. In addition, everyone from the team can have his or her personal calendar, of course. The cool thing is that you can subscribe to other calendars. So if an employee subscribes to the team calendar, all events from the team calendar are fed into his personal calendar. Create a calendar for your football team, your school grade, your community organization...whatever social activities you’re involved in. Everyone from the group can subscribe to an RSS feed of the group calendar, so they’re automatically notified of new events or changes. Publish a calendar on the Web to announce events. Build a subscriber base of clients who subscribe to the RSS feed and easily notify them of last-minute ticket opportunities simply by adding the respective event to your calendar. Please have a look at CalendarHub and let me know what you think. Feedback is greatly appreciated. Congrats to Scott Mace and Barry Welch who created CalendarHub and did an awesome job. Keep up the good work! At 10over100.org, people make a pledge to give 10% of whatever they make over $100,000 each year to charity. I love that idea. If the governments of the rich countries aren't willing to cure the world of extreme poverty - although IMO it would be possible - then private persons must stand up and fill the gap. I would like something like "2 over 20" even more, as I think that almost everyone in the rich countries would be able to afford spending 2% to fight extreme poverty. But 10over100 might be more realistic. The question of efficacy and efficiency of foreign aid pops up, of course. But for now let's work with the (admittedly simplistic) assumption that money from the rich countries can prevent people in the developing countries from starving or dying from easily preventable diseases. I know things are a bit more complicated in reality and I may get back to that discussion. I, for one, pledged "10 over 0", i.e. 10% of my income. My money will go to Jeffrey Sachs' Millennium Promise project, which uses modern science to make poverty history, one village at a time. I encourage everyone to join me in this greatest challenge of our generation. Anyone creating „The Blog Street Journal“? More and more of what I read every day is delivered digitally (blogs, newspaper sites). I’m sure it’s the same for most of you. Heck, I even cancelled the subscription of my daily. It’s old news when I’m getting it anyway, and for in-depth stories I have my weeklies and monthlies. And of course for many topics I’m interested in, the blogosphere is where the action is anyway. Still, reading a newspaper on paper is a more pleasurable experience than reading news on screen, at least for me. If an article is more than one page long, most of the times I’ll print it. That probably won’t change until screen resolutions come much closer to print resolutions. When screens become lighter and more flexible that will help to. What I’d love to subscribe to is a daily, printed edition of the best posts from the blogs I read. A bit like a printed Findory, but even more tailored to my interests. A smart attention engine like TailRank would be required to find out the most interesting postings from thousands of postings from hundreds of feeds. Digital on-demand printing has become cheap enough, see NewspaperDirect or this new company there. Even if this is perfectly executed, a big question remains. Is blog content suitable for the paper format? Lack of hyperlinks. Blogs make particularly heavy use of hyperlinking to other blogs and other resources. Not being able to go to these links with one click would be a big downside. Human intelligence. Attention engines will be great for pre-selecting postings (getting it down from thousands to hundreds) but I don’t know if they will work well enough to get the selection down to a number of postings that fits into a newspaper. Time lag. Do the advantages of the paper format outweigh the delay of around 24 hours on average between publishing and reading? If anyone builds The Blog Street Journal, it will never replace real-time blog reading. It could be a great addition though. Let me know what you think! P.S. : Somewhere in between reading blogs the usual way and The Blog Street Journal would be a service that creates a nice-looking PDF out of your favourite blog content. If the user rates how well the postings were selected, the results could become constantly better over time. The whole job of getting the content, creating the PDF and sending it to the printer could be done automatically, of course. So you would find your latest Blog Street Hourly in your printer’s output tray every hour. P.P.S. : Even if none of these ideas ever become reality, maybe this is at least the future of newspaper delivery? Printing a newspaper and shipping it hundreds of miles to the customer, only to have the customer throw away 90% of the newspaper (because I never read the sports section, for example) doesn’t seem very clever, does it? Technically speaking, Meetro is radius and proximity based software. Untechnically speaking, it finds like-minded people around you instantly. Wherever you are. So whether you’re in-town or out of town, Meetro gets you on the town with old friends or new acquaintances. immedi.at helps you to keep track of online information as it changes. It sends you an instant message whenever any RSS or Atom feed you want to monitor changes. Don't use this for your whole OPML file, or an IM will pop up on your screen every few seconds. A good way to keep an eye on selected feeds that are most important to you though! eHub did a nice interview with Paul Youlten, the founder of a great project called Yellowikis. Yellowikis, as Paul put it, is "the 10 month old love-child of Yellow Pages and Wikipedia". Putting the Yellow Pages online has been tried before but I don't know if any of those projects really took off. Yellowikis' new approach makes this new attempt really promising. I hope they will succeed, especially because of their care for developing countries and their wish to help facilitate trade in those countries. We don’t take advertising so I didn’t pay for the stats package provided by our hosting company. I got an email from a management consultant that said: “Unless you are in government development, why provide business information for free?” Clearly some people still don’t get that the rules have changed. It’s quite easy for two people with $75 dollars and a few hours hard work to challenge a $28bn industry (Yellow Pages) without any ambition to make a fast buck. I can hear those industry's people mumble "asymmetrical warfare". One political party wants to increase the VAT from 16% to 18%. Another party wants to keep it where it is. These two parties form a governing coalition. Question: Where do they meet? If you guessed 17%, you're wrong. Right answer: 19%. Om Malik just coined the acronym GYM for Google, Yahoo and Microsoft (at least I read it at his blog first) and asks if you manage to not mention the GYM for a week. I think it'll be difficult. Given the resources, distribution and yes, innovative power and speed of the Big 3, the key question for most Web 2.0 startups is how they manage to compete with the GYM. BTW, someone called the GYM GMY a year ago already but it seems that acronym didn't catch on. I'm lazy about writing and I don't know if I'll feel like posting frequently. I have no idea if anyone is interested in what I have to say. Why did I decide to give it a try despite this poor starting position? It's no big deal. If I don't feel like blogging any longer after five postings, that was it. Sometimes, I really want to shout out my opinion. Blogs are a great place for networking. I hope that the blog will help me get in touch with a lot of interesting people. It's a good way to improve my English, especially if you are so kind to let me know my mistakes. I'm involved with two Web 2.0 start-ups (one is here, the other one pre-launch). How can I dare to not have a blog?